En favorit destination for rejsende fra hele verden, The Henry Derby House, som tidligere blev drevet som en B & B og for nylig blev omdannet til et fuldt hus leje i 2016. Dette historiske hjem er perfekt til familier eller store grupper, der rejser sammen og søger at udforske downtown Salem. Huset ligger centralt i gåafstand til alle Salems attraktioner, men uden for den slagne vej ikke midt i alle handlinger. Der er masser af indsamling plads til store grupper, herunder en stue, spisestue og stort familieværelse alle på første sal. Der er et opdateret køkken med nye apparater og granit bordplader, samt to fulde bade på første sal. Der er fire soveværelser med fem senge på anden sal med 2 flere badeværelser og to soveværelser og et lille legerum på tredje sal. Den tredje etage er bedst egnet til børn eller mindre gæster på grund af de lave skrånende lofter, men er meget hyggelige. Der er wifi i hele huset og en high def tv i stuen. Der er også en arbejdende pilleovn i stuen, hvilket gør det til et meget hyggeligt samlingsrum for vintermånederne. My wife child and cousins from around the country stayed here over Thanksgiving. What a great old place, spacious , funky, very New England and a great location. Clean, organized, great for big groups. Property was clean and well organized. Philip was a pleasure to work with and made sure our stay went as smoothly as possible. This is a wonderful house. Lots of space for our extended family of 9. The kids and adults loved exploring the nooks and crannies. Phil quickly solved our problem of several TVs cable boxes not working. He kindly allowed us early checkin at noon. And allowed a late checkout as we had an evening flight. The house had everything we needed. Space, quiet and plenty of family time. 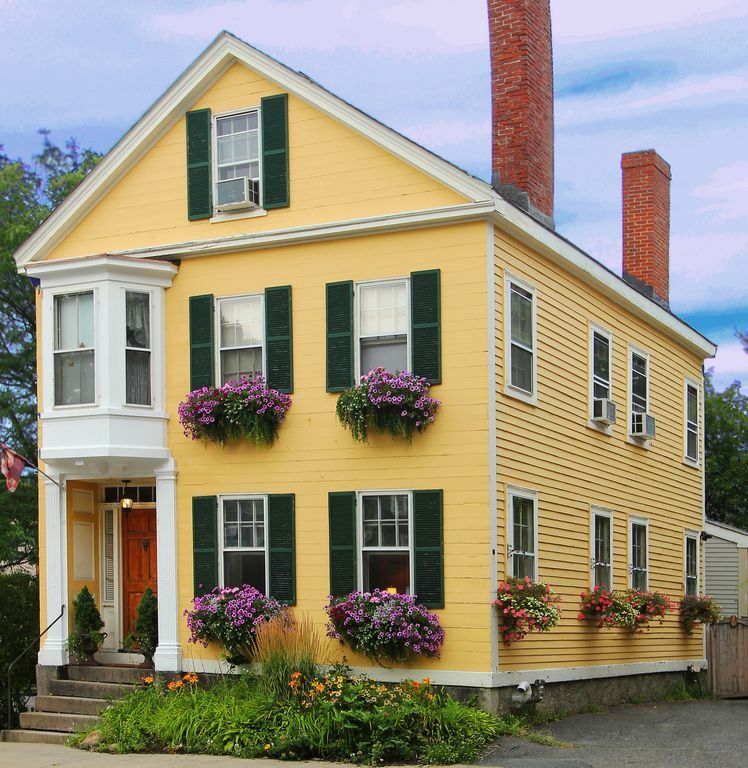 We loved our stay here and would certainly return if we ever have a family trip to Boston in the future. Lots of room for our group of 12; great location; easy walk to restaurants & attractions. The owner responded to several questions prior to arrival, and was able to allow an early checkin. the 3rd floor was filthy. One 3rd floor bedroom had no AC at all and could not be used. Shade in small single pulled right off the roller. Had trouble with the front door keys & the lock box. The garden in the back has nice plantings...and even some apples! With some needed attention, this property has great potential. Thank you very much for your detailed review of our property. I am sorry that the house was not cleaned to your satisfaction. If you had let me know during your stay I would have sent my cleaning staff back to do a more thorough job. I will be in touch with them to let them know what they missed before your stay. We have been doing our best to declutter this house and have been trying to seek a balance between keeping some of the old decor and updating to more modern furnishings. I will take into consideration your opinion on having less items in the house. It can be a challenge to keep this house cool in the summer but we do have AC’s in all of the bedrooms. The room on the third floor with a futon is not counted as a bedroom in our description for that reason. It can be used as one if a guest chooses to but it is not listed as one because it does not have an AC. I have updated all the keys so they will work better in the front door. I know that one of them did stick from time to time so they are now replaced. There should not be any issues with the lock box if you know how to use one. Thank you for your compliments on the garden. We have a new gardener this year and she is fantastic! Very happy with what she’s done with the garden. We are always striving to give our guests the best possible experience at our house so please, PLEASE let me know if there’s anything I can do to better your experience DURING your stay. There’s nothing I can do once you’ve checked out and I’m first hearing of all these issues on a review on Home Away. I would have been happy to address any and all of these concerns while you were at the house. I am always available on my cell phone and very close by to handle any possible issues that may arrive. Don’t be shy! Just give me a call. Wonderful time was had by all of us. We enjoyed our stay at the Henry Derby house in Salem very much. Plenty of beds, air conditioning, washers and dryers and close to down town so we were able to walk a lot. The last day it rained but the rest of the time the weather was very cooperative. My daughters were happy to find a Dunkin Doughnuts shop nearby. Thank you for a wonderful stay. property was well located. it had everything we needed. the keys were tricky. some of the lights were out. phillip was easy to work with before and after. Vi er beliggende i McIntire District of Historic Salem. Vi er tættest på Witch House og Gedney House, men også gåafstand til Salem Witch Museum, Peabody Essex Museum og House of Seven Gables. Vi er også meget tæt på bryllup spillesteder som Hamilton Hall, Hawthorne Hotel og Salem Waterfront Hotel. Familier besøger vil også gerne besøge Salem Willows som handler kun om en 5 minutters kørsel. The Salem Commuter Rail og Salem Ferry også gøre for nemme dagture i Boston. Andre dagture mennesker nyder er op langs kysten til naturskønne Rockport eller Gloucester. A cleaning fee of $150.00 is added to every rental as well as damage protection. Please inquire for rates for long term rentals (more than one week). Also note that our peak season rates are different in the month of October and the week of Halloween.